No, I didn't drive Narragansett pacers for George Washington. Some writers seem to imply that I've been around for most of the nation's 200 years, but I have been handling trotters and pacers for about a third of that time and I have been privileged to live where I could choose my own lifework and follow it where I pleased. is a good deal similar to the others. But we change our methods and, if you stay alive, you have to experiment. You follow up the things that prove good for you, and you discard what doesn't give you good results. You change your methods with the change of the breed and the change of the system. You don't train horses now like you did even 10 or 15 years ago. It's a different breed, a faster breed, and the whole style of racing, of maneuvering, is different. In a measure, it's more like the runners. Horses go more from wire to wire. It's developed more speed than we ever had before. The faster tracks, track maintenance and the use of the starting gate-- so a horse actually only goes a measured mile in a contest‑-that makes the difference. There's not so much Indian-file because you can't wait that long. Very few times can you maneuver a horse exactly as you plan. You have to act as circumstances develop, because if you wait until you think your horse ought to be moved, the holes may all be closed and you've nowhere to go. Authority was established, it took over more than 500 acres. Some of it is flooded now. The rest of the farm was cut up and my sister has a farm, and Pickens has a farm. I would hardly call my 75 acres a farm but I've got my barns and stuff there including the track. I'm not really a farmer and don't even do horse farming now. I keep pasture enough for turn‑outs and I did have a couple of broodmares until a year and a half ago. I had Sarabel Hanover who was the dam of this Tip Count horse I'm racing now. She was killed by lightning. Then Worthy Eve who was 22 and blind, had an internal hemorrhage when she tried to foal last year. She was a good old mare I'd bred and raced. My father was I. P. Russell, and he was a corking good practical horseman who had good hands and could drive. He loved racing. He didn't get any kick out of just winning a race, but if it was hard fought and he or I would get back with a winner, he'd enjoy that fully. Almost from the time I was about 18, I commenced to race about everything we had, but sometimes we'd have a stable going two directions at Fairs and he'd race one wing and I'd race the other. I went to county fairs through the South, and went up to Ohio in 1924 and raced mostly in Ohio and Indiana for many years. When I had a horse that appeared worth taking to the Illinois State Fair or the Indiana State Fair, why over we'd go, and I often raced the Ohio State Fair. Ohio was a good proving ground and had about the best Fair racing in the country. When I first went to Ohio, I had an old pacer called Dixie M. He had no breeding but raced real well, and I had a mare called Miss Fortune. These would be cheap horses now but they were pretty successful then. Later, when they started colt stakes, we had a good number of colts through there. In fact, at one time they were going to make them Ohio‑owned and they didn't on our account, because we had patronized their colt racing program from the start. We had winners like Florrie Mae and a horse called Sir Laurel Guy in the '30s that won nine of 10 stakes in the 3‑year­-old division and got a record of 2:05. I had other good horses like Queen Wilkes with a mark of 2:00.2 and later on I raced Johnny Brown who won close to $80,000 and was a horse my father bred. Then I had Hal Tryax who raced in the Ohio Colt Stakes as a 2-­year‑ old in 1949. I gave him a record of two minutes in a time trial and sold him to New Zealand after he retired from racing. He turned out to be one of the greatest stallions down there. A lot might be attributed to the fact he had so much Axworthy in him. When he went over there, they had that Scotland breeding, U Scott and those horses, and for some cause his excellence passed on. That Young Quinn is out of a mare by Hal Tryax. 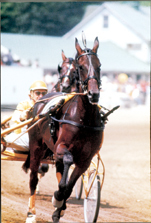 So by chance or fate, I sent the sire of the first millionaire horse to New Zealand and later bought and developed the first millionaire trotter in North America. 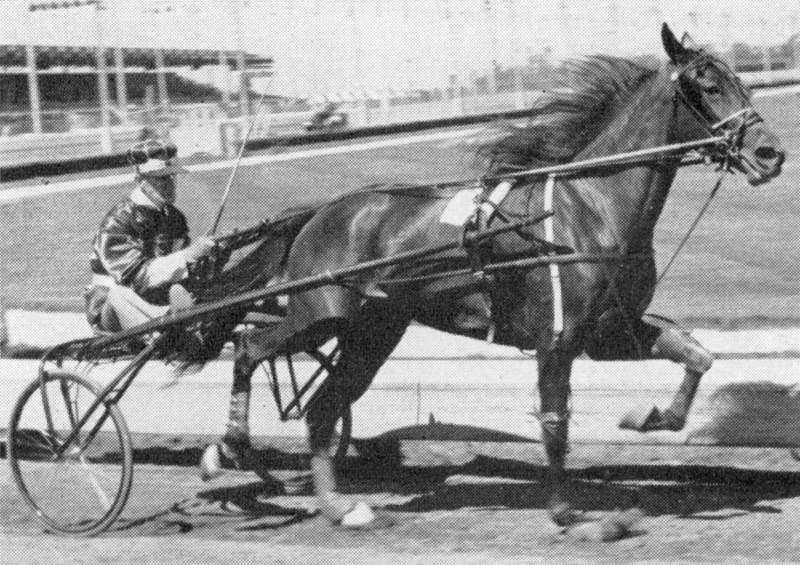 Cardigan Bay, a pacer, was the first harness horse to win a million, and he was sired by Hal Tryax. Sanders Russell behind "FRESH YANKEE"
Fresh Yankee was America's first millionaire trotter. You just can't match Fresh Yankee's story. Actually, she wasn't bought to be sent to my farm for training. More or less by chance, Mr. MacDonald said, "We can't take her home right now. Better take her down and train her." I said, "Well, if we're going to train her, we want to keep her in some good filly stakes. She might be a good filly." And she was! I bought her for Duncan MacDonald of Nova Scotia. I bought two world champions for those folks in Nova Scotia with an investment of $3,100. Gratis Hanover cost $2,200 and she was tops in her year and set a world record for 2‑year‑old fillies over a half‑mile track at Delaware. Fresh Yankee cost $900. I can't claim to know any more about the colt business than those people who buy for $140,000. If you get your choice of all yearlings, you get a better shot, but on every one of them you can throw the price tag away and go and train them to see what they're going to be. Nobody knows. Fresh Yankee trained nice from the start. She was a very eager filly and I always had to be very careful not to let her get over‑anxious. She was a kitten in the barn and all fire on the race track. She had a great set of lungs, a great gait, and a will to stay trotting and fight it out all the way. But you couldn't try to hold her away from the gate. If you'd let her rub her nose on it, she was perfect. Sometimes I'm asked whether I resented having Fresh Yankee taken away from me, just as they asked Harry Harvey when he lost Albatross. I say it all depends on the circumstances and sometimes it's a natural sequence. I was not planning to go to California in the Fall of 1968 and Mr. MacDonald turned her over to Joe O'Brien. Had he inquired of me, I'd have sent her to Joe anyway. Later on, there was a time when Joe didn't suit him either. Mr. MacDonald may have made a few mistakes but he's chosen some pretty good horses on his own and done well since then. But he'd never even seen Fresh Yankee. He just asked if I could find him a cheap colt and I'd asked what he wanted? And how much? He didn't care what he got but a thousand dollars was the limit. So I got him Fresh Yankee. Now I would never buy a colt I thought was common bred. Fresh Yankee was from the first crop of Hickory Pride and from a Titan Hanover mare that hadn't produced much but the blood lines were there and the filly nice and trim looking, not over large but not stunted, either. She hadn't created much notice and was one of Charlie Keller's first sales, so nobody was paying much attention. acquainted with Mr. A. C. Petersen from Connecticut while I was racing in New York. Petersen owned a mare named Volo A. C. that I beat with Amy Scott in 2:02.3 one night and not too long afterward I started handling Petersen's stable. Mr. Petersen often bred his mares to Hanover stallions and when he bred Volo A. C. to Hoot Mon, he thought the yearling, named A. C.'s Viking, ought to bring $20,000 at auction. I advised him not to sell, but he put him in and then bid him back. So I got him to train. He was big and a little growthy but had the kind of a gait you hunt but seldom find. He was a natural from the start and could trot barefoot or anyway. He wasn't sound his 2‑year­-old year in 1961 until well up into June. Something seemed to be bothering him and Mr. Petersen suggested I turn him out for a rest. I said I wouldn't hurt him but would like to play along for a while. But he sure matured during the winter down at the farm and I guess he won more in 1962 than any trotter ever had won in a season before that year. He won $198,000 and we weren't racing for the money they race for today. Bad luck almost cost me the Hambletonian chance. I raced a horse called Mighty Indian at Yonkers And won with him in 2:01.3 and pulled up quickly after the finish line but the fellow driving hard behind me never looked up and just ran right over me. He knocked me out 50 or 60 feet past the wire. Broke my sulky down and I hung my heel in the right stirrup and my ankle was turned around. I thought it was broken when I was carried into First Aid, but when the doctor pulled it straight and I didn't hear any bones crunch it almost made me forget how much it hurt. They did take a piece of bone out of it and I was on crutches and wore a cast. I got the cast off and a doctor in the hospital put a football wrap on it the morning of the Hambletonian. I also had my stirrup padded so it wouldn't be too uncomfortable, and of course when A. C.'s Viking won in straight heats, it didn't hurt a bit! Some people think an accident I had at Delaware might have resulted in the USTA making safety helmets mandatory. My mare got rough, caught a boot and threw me out on my head during a Grand Circuit race and my helmet was splintered. It could have been my head. Octave Blake, when he was president of the Grant Circuit, saw two horses collide in front of me one night at Roosevelt Raceway and I went up over the pile. Within a week's time he had sent a box of those first make‑shift helmets we used to put inside of our caps. The next Spring they brought a box of baseball helmets for us to try and I found one that Duke Snider has used that just fit me. I wore it for several years. Don't know whether I had that one at Delaware, but whatever I had saved my life. I remember going up and hitting the ground and didn't come to until they were putting me in the ambulance. I had a broken shoulder and collar bone plus cracked ribs and a fractured skull in spite of the helmet. I wouldn't have known about the skull fracture if I hadn't had an ear leak, and that ear has never been as good since. They tell me that was an impressive tumble. It sure impressed me! The USTA had the power to make helmets mandatory, but you often hear people gripe that the USTA does nothing about Off‑Track Betting, Mini­Theater betting and the like. So far as business matters affecting betting are concerned, the USTA can only use its influence and educational abilities. Every state commission is supreme on what goes on in its state. Too many people think the USTA has the final say on everything. It doesn't have. Some of the things politicians do can be disastrous to harness racing, but realistically you have to face facts as they come along and not every one is pleasant. I've had a lot of pleasure, driven some great horses and can't think of too many ways I'd want to change my life if I had it to live over. I still remember my first winner, an old gelding named Frederick who had a jack on one hock about half as big as your fist. He'd hike a little, too, but had perfect manners and I won with him at Griffin, Georgia, when I still was wearing short pants. Then there was Tronita, a mare I bought for $160 and won eight stakes for 2‑year‑ olds in Ohio. She beat Eva's Boy who set a world record that year. The next year, Tronita won 11 straight stakes. I drove Chestertown, who won the first two‑mile championship at Roosevelt. I had big, old, clumsy, free­legged Scottish Hanover that went in 1:57.1 and I'm proud of so many others. Summing up, my career has been an association with horses and people. If I have contributed, either to my home community or to the health and upgrading of harness racing, the rewards have out‑balanced the effort to do so. I was privileged to be on the committee that worked out and consummated the first contract ever negotiated between horsemen and race tracks at Roosevelt and Yonkers. As a USTA director, I have worked with a wonderful group of people dedicated to meeting the challenge of change and growth of the sport which has become a major industry. For a number of years I had a partnership annually with L. B. Sheppard of the Hanover Shoe Farms. He never took any part in selection, price or management and was a wonderful partner. Our first was Farand Hanover who proved a successful stakes colt and we sold him to the Italian government where he proved a successful sire in that country. Our last was Dart Hanover who, in spite of having to complete with Nevele Pride, Snow Speed and the like, won just short of $200,000 before being sold to Sweden for that nation's first purchase of a six­-figure horse. That he returned to the United States three times to compete in the Roosevelt Internationals and wound up winning the Prix d'Amerique in Paris, has been a great satisfaction to me. Also, while on a European tour, my wife was privileged to see Dart win two of the top races there at Munich and Stockholm. Mrs. Russell has stuck by me through the vicissitudes of more than 50 years. She has watched with the owners, enjoying winning efforts and sharing the miseries of bitter defeats. Our two sons, Walter and Henry, both of whom are Ph. D's and college‑level teachers, groomed horses during summer vacations. Walter has been in racing as Presiding Steward for many years, while Henry has continued his profession as a language professor. Naturally we are proud of them. I was both pleased and honored to become a member of our own Living Hall of Fame, and of Alabama's Sports Hall of Fame. But possibly one of my greatest satisfactions came when three of the eight starters in one of the Internationals, Fresh Yankee, Dart Hanover and Noccalula, all were graduates of my stable. 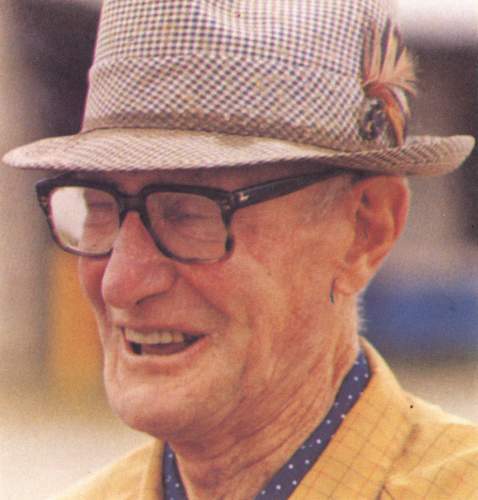 RUSSELL-TALK:Three Generations of the "RUSSELL FAMILY" talk..."Harness Horses"